Southwest Airlines is an extremely popular U.S. low-cost carrier for a number of reasons. They regularly offer cheaper fares compared to other airlines, and they’re very transparent about their fees. Southwest doesn’t charge for most of your luggage (your carry-on and first 2 bags fly free), and they don’t issue change or cancellation fees. Additionally, Southwest gets pretty great customer satisfaction ratings and provides a fairly comfortable inflight experience with some freebies along the way. 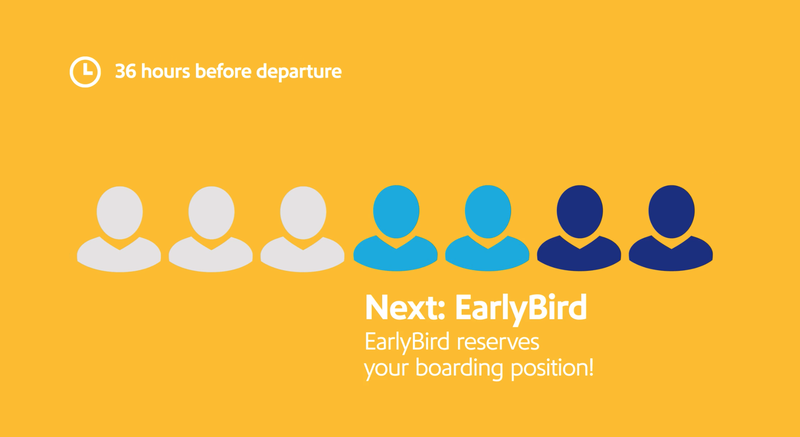 However, when it comes to seat assignments and boarding, Southwest does things a little differently — that’s where their Early Bird Check-In® comes into play. What Is Early Bird Check-In? So, Do I Need Early Bird Check-In? 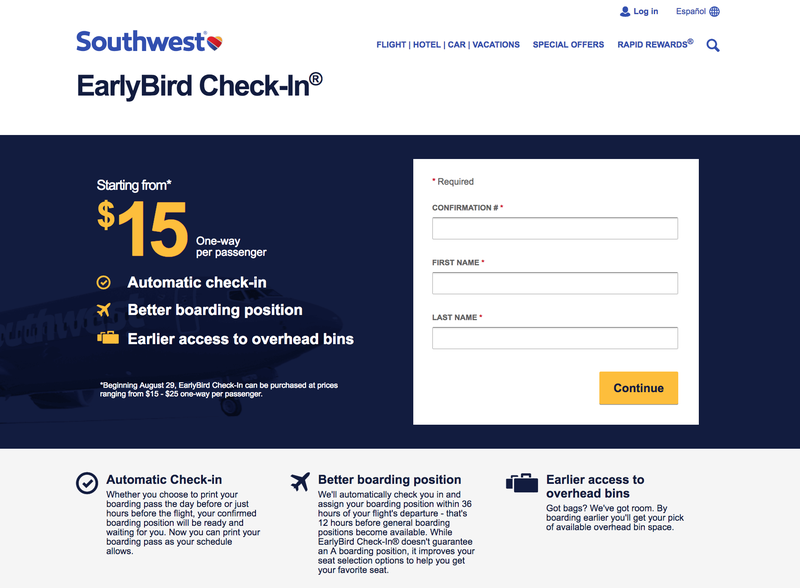 Early Bird Check-In is an optional Southwest Airlines add-on that provides the ticket holder with automatic check-in starting at 36 hours prior to the flight’s scheduled departure time. For $15-$25 one-way, Early Bird Check-In customers are automatically checked in and assigned a boarding number before the general 24-hour self-check-in period. Pricing depends on the length of the route and the popularity or demand for Early Bird Check-In on each specific route. To realize how Early Bird Check-In can be a plus, we need to take a look at Southwest’s boarding process. If you’ve never flown Southwest, their boarding process can be slightly confusing. If you’re familiar, you’ll instantly see the benefits of Early Bird Check-In. Southwest Airlines doesn’t assign seats. Instead, passengers line up at the gate according to boarding position; once called, they are free to sit in any available seat on the plane. So how does Southwest decide who boards first? Boarding numbers are assigned by Group (A, B, or C) and Boarding Position (1-60). Boarding flows in order from A1 through C60. Again, once you board the plane, you may sit in any available seat. Hot Tip: In general, the earlier you check in, the better your boarding position will be when flying Southwest (cue Early Bird Check-In light bulb!). Southwest Preboarding: SWA states that preboarding is reserved for customers that have a “specific seating need”. This need may be considered to accommodate a disability and/or need for assistance in boarding or stowing an assistive device. All passengers requesting a preboard designation should notify a Southwest Airlines employee either at the ticket counter or at the departure gate, prior to boarding. In order to verify a passenger’s necessity to preboard, agents may ask the passenger “factfinding questions”. Those who meet the qualifications will receive a new boarding pass with a preboard designation. Southwest also states that if a customer with a disability simply needs a little extra time to board, they will be permitted between Group A and Group B, before Family Boarding. These individuals should also speak with a gate agent and will likely be reissued a boarding pass with an extra time designation. SWA’s general policy for those traveling with a preboard passenger is that only one “travel companion” acting as an attendant may preboard alongside them. Any other family/friend is required to board with by their assigned boarding group and number. A small detail to note: Preboard individuals may not occupy an exit seat. This doesn’t mean A16 is always the sixteenth person to board — there aren’t always 15 people who purchased a business fare. If there are open A1-A15 positions (i.e., 15 business fares haven’t been sold), then the gate attendant may give passengers an option of upgrading their position just before the boarding process begins for $30, $40, or $50 per segment depending on the itinerary. The best positions following A1-A15: Usually assigned to A-List Preferred/A-List Members and passengers with EarlyBird Check-In. 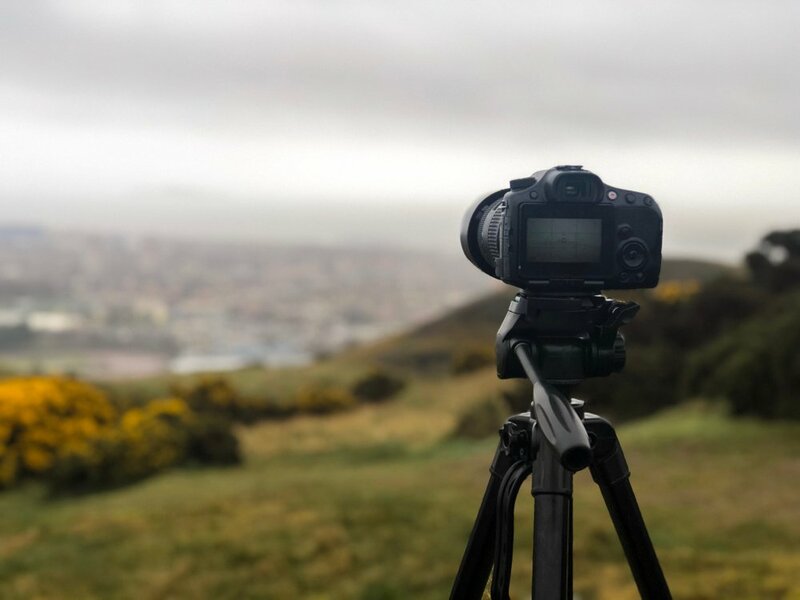 Southwest states that these distinctions in and of themselves do not guarantee an A boarding position, but they do ensure that you will receive the earliest position available. Family Boarding: Families traveling with children 6 years of age or younger are allowed to board together between A and B groups. Non-priority positions: General positions are distributed after all Business fare, status, and Early Bird Check-In passengers have been assigned. The remaining boarding positions are assigned in order of the time a passenger checks in. For this reason, you’ll find many Southwest passengers set reminders to ensure they’re checking in at the very moment check-in opens. This can be a huge pain if you’re busy at that time or you simply forget the 24-hour policy. Earlier boarding positions usually go in a matter of minutes. Additionally, if the flight is pretty full and you’re the last to board, there’s a chance that your carry-on may not fit in the overhead compartments, meaning it will have to be checked. Southwest doesn’t charge extra for this, but if you’ve only packed a carry-on to expedite your airport process, you’ll probably be disappointed having to wait at baggage claim. Remember, even if there are quite a few families (flights to Orlando for example), they all get to board between A and B groups. A note about boarding “direct flights”: A direct flight is where a plane flies from an initial destination to a final destination via one or more intermediate airports. In the case of a direct flight, the flight number does not change and passengers already onboard that are flying straight through to the route’s final destination do not have to disembark. This is a consideration in regards to boarding as these passengers will be on the plane, occupying seats, prior to new passengers boarding. Southwest doesn’t limit the number of passengers who can purchase Early-Bird Check-In. This means that purchasing Early Bird Check-In won’t necessarily guarantee you an A boarding position. Does that mean there’s a boarding order within the early birders? The short answer is yes. Basically, the earlier you purchase your ticket with the Early-Bird add-on, the higher your boarding number will be. When can Early Bird Check-In be purchased? Customers usually purchase EarlyBird Check-In as part of their original flight purchase. However, if not purchased with the initial ticket, customers can add Early Bird Check-In to a flight after purchase up to 36 hours before a flight’s scheduled local departure time. Early Bird Check-In is nonrefundable. If a customer cancels his or her flight, the Early Bird Check-In fee for that particular flight is not refunded. However, if the flight is canceled by Southwest, the fee will be refunded. Technically, no one needs Early Bird Check-In. On the other hand, whether or not you want it depends largely on your personal preferences. Keep in mind boarding positions go fast, and you never know how many other passengers have opted for this add-on. Technically, “saving seats” is discouraged, but it’s rarely reprimanded. You might have to cancel your flight — remember Early-Bird is nonrefundable! Bottom Line: In our opinion, if the up-charge isn’t a huge financial strain and you don’t want the stress of boarding toward the end of the pack, go ahead and add it. If you’re purchasing a ticket on Southwest.com or via the mobile app, there’s no doubt you’ll be prompted with a pop-up or other notification asking if you’d like to add Early Bird Check-In to your ticket. If the answer is yes, simply select it at that time and continue with your purchase. If you’re making a reservation over the phone with an agent, they will ask if you’d like to purchase Early Bird before completing your transaction. If you don’t’ select Early Bird Check-In with your original ticket purchase, you can still add it to your itinerary up to 36 hours prior to your flight’s scheduled local departure time. Tips for Online Purchase: It’s really easy! If you’re opting for adding the perk online, you simply need to enter your confirmation number, first, and last name. Southwest will then bring up your itinerary and the proposed pricing at which point you choose “Continue”. You will then be directed to a payment page where you enter you’re preferred method of payment and select “Purchase”. And that’s it – Early Bird Check-In has been added to your itinerary! You should receive e-mail confirmation of this addition. Technically, yes, but you have to go a slightly round-about way to do so. 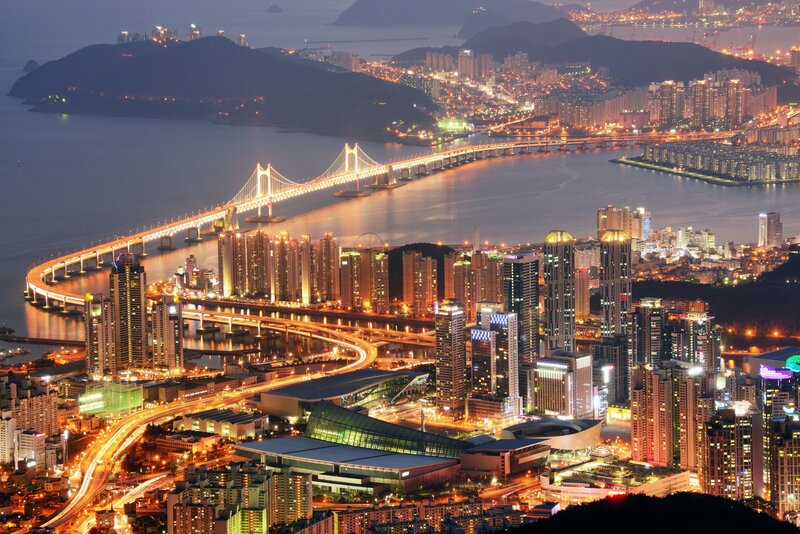 If you want to add Early Bird for just one person, you have to add early-bird to an existing itinerary. You can do this in the same way we explained in the “After Your Original Ticket Purchase” section just above this. If you have the right credit card in your wallet, your Early Bird Check-In fee can be reimbursed as a part of your yearly travel credit. The table below outlines which cards allow for this great little travel hack. 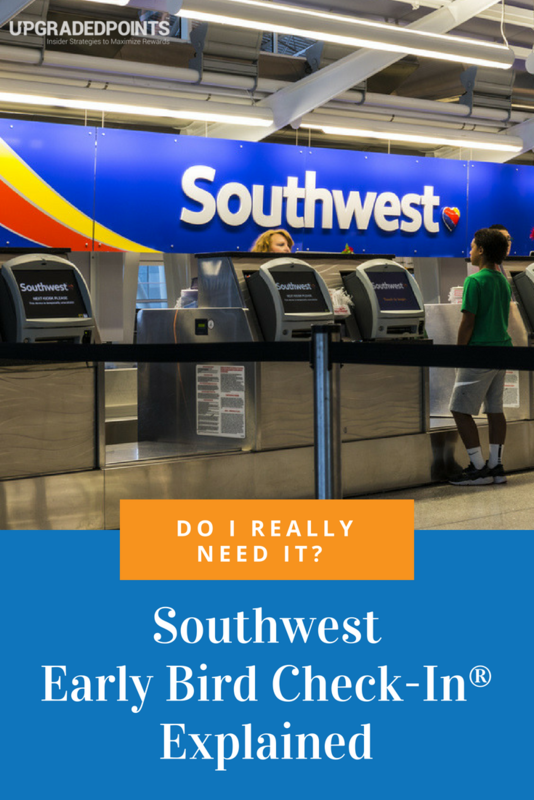 Early Bird Check-In can be useful if you don’t want to deal with the stress of Southwest’s self-check-in policy, which requires action exactly 24 hours before departure. Additionally, you should strongly consider Early Bird Check-In if you’re pretty particular about your seat; while it doesn’t guarantee A Group boarding, it certainly gives you a much better chance of nabbing your desired spot. However, if you’ve already got priority boarding through your business class fare or status, you won’t need this add-on. Similarly, if you’re traveling with kids under 6, you’ll already board right after A Group and likely won’t need it either. Lastly, you could be on the fence. If you’re going back and forth about it and you’re worried about the added cost, remember you’re already saving on baggage fees (which are usually ~$25-$40 a piece on other airlines), so $15 per ticket doesn’t seem all that bad. Alternatively, if you’re on a route where the fee is $25 per ticket, the decision could be a bit more difficult. As a last note, remember – if you’ve optimized your purchase by using a credit card that covers the fee, your Early Bird Check-In is basically free! How much does Southwest charge for Early Bird Check-In? As of February 5, 2018, Early Bird Check-In costs $15 per one-way ticket. Southwest notes that a credit card must be used to purchase this add-on. Do you have to check in with Southwest Early Bird? Southwest Early Bird Check-In is an automatic check-in process. Passengers who have purchased Early Bird Check-In are automatically checked in for their flight starting at 36 hours before departure. Passengers do NOT have to perform self-check-in at 24 hours if they purchase Early Bird. How does Southwest determine boarding order? Can I pay for Early Bird Check-In with points? No. Early Bird Check-In can only be paid for with a credit card. However, some credit cards offer a travel credit that will reimburse you for this Early Bird fee (see table above). Is Southwest Early Bird Check-In Worth It? The answer really depends on your travel preferences. If you don’t want the stress of 24hr self-check-in and you’re particular about which seat you get (aisle vs window, front vs back) then it could definitely be worth it. If you’re a business traveler and already have priority boarding (or any other traveler with priority boarding – i.e. you have status, you’re a family with kids under 6) then you won’t need Early Bird. If you’re in conflict, remember you’re saving cash on checked bags – the $15 per ticket for Early Bird is quite a bit less than the typical baggage fees on other airlines. AND, if you use the right rewards-based credit card this fee could be covered – your Early Bird Check-In is basically free! my phone tells me the price is $25 not $15.00 for each way! Pretty bad to have to pay $50.00 for this. Hi Evelyn – yes, we recently learned about this too and are about to update the piece. Thank you for the nudge. $50, as you say, is pretty hefty and I’m sure it’ll turn away a lot of people who were previously buying Early-Bird. $15 e/w was fine, $25 is not fun. Airlines can be generous (e.g. Southwest don’t charge for seat selection or baggage) but then as you can see, it is made up in other areas! My daughter and friend are travelling from Las Vegas to Denver, then to New York on Southwest. They have a early check in ticket and Wanna Get Away. If they log on 24 hours before will it show they have checked in if it normally does it 36 hours before? Just want to make sure it will all be ok for them. They will also have 2 bags to check will they have to do at the airport? Sorry I’m from Australia and your airlines are different then ours. Thank you so much. Hi Cindy, yup! It is automatic since this is an extra service you already paid for. Additionally, you will need to arrive earlier to the airport to check your 2 bags. I paid for upgrade at the airport in Baltimore and received A5 to board however the gate attendant let on first not only people reboarding but also families and allegedly, people with “ medical conditions” one of those were a couple not much older than me with clear B passes and a very fit woman with her dog. We were told they had medical conditions when we questioned the gate attendant. Apparently, that gate attendant did not read this article and needs to be retrained. I want a refund! I purchased the Early Bird Check In. When and how do I get my boarding pass? Do I automatically receive an email of the boarding pass when they automatically check me in? Hey Cynthia, you will receive an e-mail of the boarding pass and you will be automatically checked in if you purchase Early Bird check-in. I purchased one senior ticket and 2 adult tickets to Los Angeles Ca. However my senior conf # is separate from the other two confirmation numbers. At some point we have to change planes on both the departure and the return flights. If I pay for early bird for all three tickets, does that cover the early check in on the other planes when we have to transfer? Early check-in only applies once per direction, no matter how many segments you have. Thanks for reading! Is there any advantage to purchasing your tickets in advance at the southwest ticket counter? Hi Bill, I don’t totally follow. The boarding number that you get when buying Early Bird depends on the number of other passengers who have also bought an Early Bird, as well as A-list members on the flight. In other words, the sooner you buy your ticket with early-bird, the lower your boarding number will be. It’s almost always an “A” number when buying Early Bird. For quiet flights that we’ve booked early on, we’ve been allocated A11 or A12 (from memory) but usually you’re in the A20’s. If 3/4 of the passengers have purchased Earlybird check-in is it worth getting the early bird check-in still? No, if 3/4 of the passengers bought Earlybird too, it would essentially be worthless. The kicker is that you never know how many Earlybird check-ins have been purchased. Although I think that scenario would rarely occur. I purchased the early-bird check-in. Will I have to print out a boarding pass before heading to the airport, or can I just show SWA employees the email on my phone indicating the boarding pass? I won’t have access to a printer. Thanks. Hi Carol, if you download the actual boarding pass on your phone you will be able to board with that. I usually snap a screenshot of it and keep it in my photos so I don’t have to go through the process of logging into my e-mail, etc when time is tight like at security and when boarding. Have it pulled up and ready or the lovely passengers in line behind you will likely get a bit agitated. Alternatively, Southwest has self-check-in kiosks at most airports, where even though you’ll already technically be checked in thanks to your early-bird status, you can print your boarding pass if you want a paper copy. The difference in pricing is according to the length of the flight and the popularity of early bird check-in on the route in question – it’s determined by Southwest & subject to change at any time. I am a novice flyer and need to clarify what I need to do with Early Bird Check In which I purchased. Will SWA automatically notify me by email that I am checked in 36 hours in advance of my flight? Will they email me the actual boarding pass that I could print out or do I need to go to a kiosk at the airport to print one? Yes, if you purchase Early Bird Check In you will receive and email from Southwest with your boarding pass. You can keep it on your phone to scan or you can print it out. If for any reason you don’t get the email or if you can’t find it, you will also be able to print out a boarding pass at the Southwest kiosk in the airport. Hope this helps! I am flying to Baltimore, MD from Albany, NY on 11/21. My son made the arrangements with a SW gift card he bought me. I want to purchase Early Bird check in. Do I do that 36 hours before the flight? And what would be the charge for that since I am flying Albany NY -Baltimore, MD? Hi Anne, do NOT wait until 36 hours before your flight – you will want to purchase Early Bird Check-In as soon as you know you would like to add it to your ticket. 36 hours is the time at which Southwest checks in anyone that has purchased early-bird check-in so you’ll be too late if you wait! You can log in here with your confirmation number and your name to find out the price. The app is charging $40.00 for the entire trip not $30. How do I get the Early Bird for $15.00? Hi Jackie, Southwest’s new policy on Early Bird Check-In states the price is “starting from 15” and can be anywhere from $15 to $25 (one way). 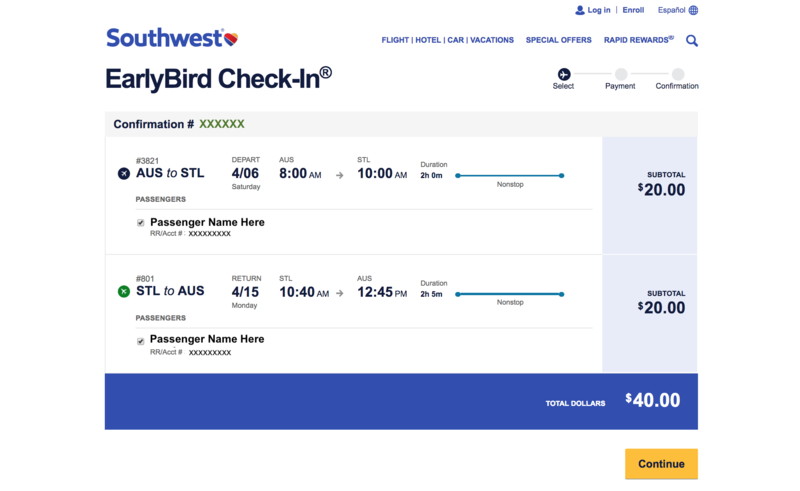 According to Southwest, the difference in pricing correlates to the length of the flight and the popularity of early bird check-in on the route in question – it’s determined by Southwest & subject to change at any time. I purchased a ticket for me and my son and added the Early Bird. I understand I will get an email with my boarding pass. Will I also get an email for my son’s boarding pass. I did not give SWA his email information. You should receive both boarding passes for you and your son, assuming you bough the tickets together and you’re both on the same reservation. If we have 3 on our reservation, can we purchase early for 1 passenger and have them “hold” seats? Hi Angie. Technically, you can do this as Southwest does not have a policy against holding seats for others. However, if other passengers have paid for Early Bird, they would be entitled to sit in those seats if they choose to. The other 2 travelers in your party did not pay. So, the answer is yes you can do it but other passengers might be upset. If I can purchase early bird check-in up to 36 hours before my flight, why am I not able to purchase it four days before my flight? Hi Clifford. Normal check in begins 24 hours in advance of your flight. By purchasing Early Bird Check-In, you will automatically be checked in 36 hours in advance, a real benefit. Unfortunately check-in in any form is not available any further in advance than the 36 hours. Thanks for your question. If I purchased Early Bird seating and have to change planes (not a direct flight), will I still have Early Bird seating on the connecting flight? Thanks! Hi Mary, Southwest Representatives report if you’ve purchased a ticket with a plane change and also purchase Early Bird Check-In, you’ll automatically be checked in for both of the flight segments with your EarlyBird purchase. Since you will have a separate boarding pass for the second flight, your boarding letter and number may differ from your first flight – it will just depend on when and how many other passengers purchased EB for the second flight. My husband and I will be travelling from Phoenix, AZ to Islip,NY. We will both require wheelchairs. Should I still purchase the Early Bird check-in for us to make sure we both get aisle seats? That shouldn’t be necessary. Southwest allows anyone needing extra time to board right after the A group and before family boarding regardless of boarding group. I would suggest letting them know about any special assistance you might need if you haven’t already. You can contact Southwest at 1-800-I-FLY-SWA (1-800-435-9792). Have a great trip. If you will require a specific seat, speak to the gate agent when you check in. I have purchased this for my flight on Thursday that leaves around 10:30 am. Will I have my boarding passes after 10:30 tonight? Southwest’s EarlyBird Check-in automatically checks you in starting at 36 hours prior to the flight time. You should be able to access your boarding pass from 24 hours prior to the flight. You are automatically assigned a position based on the number of business select customers that have purchased a ticket, the fare type you selected, the number of A-List Preferred passengers, the number of other passengers that have purchased early-bird, the time at which you purchased your ticket, etc. As you can see, there’s a lot that goes into this but in a direct answer to your question, you should be able to access your boarding pass from 24hrs out from your flight time. I purchased Early Bird and, if as you say I don’t have to manually check in, why was I prompted to do so when I went to download my boarding pass? At no point did I get a message telling me that I was already checked in. Hi Izzi, we’re not sure why Southwest uses that prompt when customers purchase Early Bird – perhaps they’re simply encouraging passengers to check for their boarding pass? Now, Southwest did change my return flight time and it is now 5 minutes earlier and sent me an updated email with the itinerary change. It too doesn’t show “EB”. Hi Frank, if you paid for Early Bird and received the confirmation e-mail, it should be applied to your itinerary. Have you tried logging in on Southwest’s website to look at your upcoming trip’s itinerary to see what it says there? Please be advised we are not SWA so we cannot confirm this is 100% the case. If you can’t find confirmation of your early-bird status when you log in to your account online and look at your itinerary/flights, we would suggest calling Southwest’s Customer Service line: 1-800-435-9792. Hope this helps! What a ripoff. Bought earlybird and are in the B boarding group, especially when our relatives did not buy early bird and are in A group with being on priority list, business, etc…. That must have been frustrating! Unfortunately, purchasing early bird check in doesn’t guarantee an A boarding position. 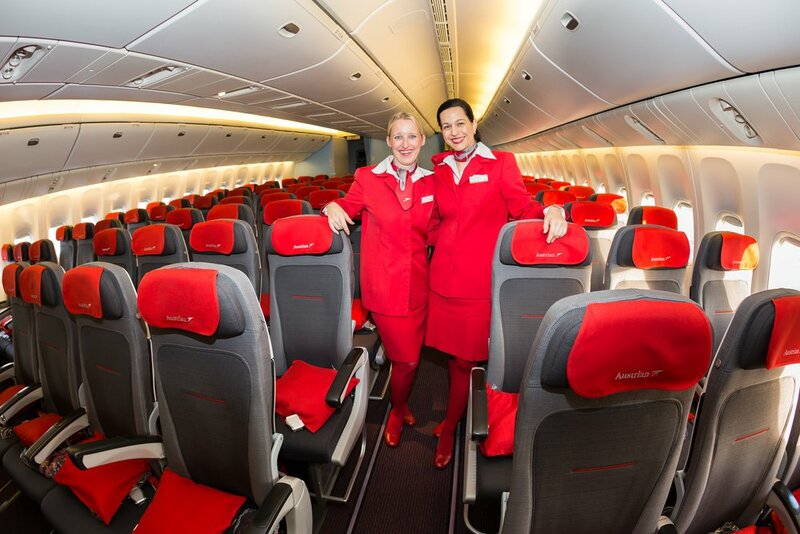 However, most of the time you will get an A boarding position. It all depends on how many business select tickets and A-List status tickets were sold for the flight. Sorry it didn’t work out for you! In my opinion, boarding is where SWA sticks it to their passengers. Something worth mentioning about early bird check-in is if you have a credit on your SW account from a changed reservation, you cannot apply that credit to EBC. Credits can only be applied to bookings. Also, if you are Chase SW cardholder (like myself) – you cannot apply rapid reward points to an EBC purchase. SW only accepts “new cash” when purchasing EBC. EBC is SW’s way of nickel and diming passengers to increase their bottom line. If I’ve purchased Early Bird for my husband but not for myself, will I still be able to Check in at 24 hrs to ensure myself a place in line? Or will It let not me Check in because we have already done Early Bird for my husband? Hi Cathy, you should still be able to check in at 24 hours prior to your flight time and we would definitely encourage doing so – you know how SWA can be with those boarding numbers! If automatic check-in is 36 hours prior to departure why can’t an EB customer manually check-in themselves at that time? That’s a good question for SWA! That is not worth $50. Hi Alison, please be advised we are not SWA however, from our countless hours of research on the topic, it appears you may not be understanding Early Bird accurately. If you purchase Early Bird, you are automatically checked in at 36 hours prior to your departure time and given a boarding number. Yes, you will still see an option to “check-in” on your app or online, but this will not affect the number you were given with early bird. Actually, many customers are finding that if they didn’t purchase early-bird and check in even 2-3 minutes after the 24-hour release, they’re getting late B, early C boarding numbers. If you hadn’t purchased early bird and simply checked in 21 hours (3 hours past the release) you would have almost certainly received a MUCH later boarding letter/#. If I’m understanding correctly, you’re stumped because you weren’t given a higher A number. There could be a couple of reasons for this, one being the fact that A1-15 are reserved for Business Select customers. You will never get an A1-15 simply by purchasing early bird. That still leaves A16-60 where individuals with A-List Preferred/A-List Members are given priority and then on to early-bird. So, if there were a lot of these customers, they would have taken up some of the spots before you. Additionally, if there were other customers that purchased their ticket and their early bird before you, they will get priority in boarding number (e.g. if they bought 4 tickets with early bird in November but you bought yours in January, they’ll get a higher assignment). Also, southwest doesn’t limit the number of passengers that purchase early bird so if every single passenger on the flight purchased early bird, there would still be preference given to those who bought their tickets first and therefore you could receive C60 even if you bought early bird. As we state above (again, we are not SWA, we’re merely reporting their policies) simply purchasing early bird doesn’t guarantee you A boarding group. Additionally, we do state above that family boarding (which Southwest does not control for when assigning early bird positions) is between A and B so if your early bird gave you B, you’re out of luck and boarding after families too. I personally agree with you in that an early B boarding assignment is not worth $50 but that’s the toss-up you’re gambling with on Southwest. That’s why a lot of people don’t feel it’s worth it, especially with the recent uptick in cost.